BACK IN STOCK!!! A foul scent and a metallic grating sound awaken you from a peaceful sleep in the midst of a thick, diverse forest. You rub the sandman from your eyes and follow that horribly industrial smell to its source... a coal mine. Thrash Metal and Punk entwined, this band's energetic pulse livens the body of a rebel. Appalachian Terror Unit is a group of punk-rockers who have a bone to pick with capitalist establishment. Surprise, surprise? The originality of this band is their attachment to mountainous regions of sprawling natural life. Hailing from West Virginia and somewhat close to the Appalachian Trail, their passion for wildlife goes unquestioned, not only due to their location but the fiery expression that is their music. This EP's full title, "Armageddon Won't Be Brought By Gods, But By Men Who Think They Are" is more than a prediction but a description of society's pretension. These men with egos and bank accounts bigger than Jupiter are naturally an opponent to any tree-hugging individual, for what is capitalism without relentless exploitation of limited resources? 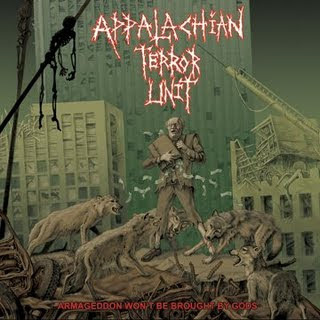 Original Description - Every once in a great while, a new band comes along with such intense fury that they captivate all who hear and see them — APPALACHIAN TERROR UNIT is one such band. Hailing from the mountains of West Virginia, ATU belt out a thunderous chorus of eco-awareness and chastisement for mankind’s destructive ways (or at least those who are in control). Musically they combine classic punk, crust, and a hint of metal into a sound that’s likened to later years NAUSEA, totally reinforced by the strong female vocals throughout. Adding to the over-all amazing quality of this EP are additional touches of brilliance, like the brutally powerful recording by Jay at the Jamroom in South Carolina (Antischism, Damad, etc.) and cover / poster art by Marald. Normally this sort of praise for a job well done is reserved for bands who have been around the block once or twice—not for the debut EP from a band barely formed a year ago.